هر چند نقش افراد در دولت‌های انتقالی به عنوان یک عنصر ضروری برای عدالت و تغییر پایدار، مدت زمان زیادی است که مورد پذیرش قرار گرفته است، اما درک عمیقی از این فاکتور مردمی وجود ندارد. پیمان‌های صلح‌آمیز و معاهدات بین‌المللی به خودی خود، صلح و تحقق حقوق بشر را محقق نمی‌کنند. همچنین حضور نیروهای حافظ صلح و یا سخنرانی‌های رهبران دینی و سیاسی نیز نمی‌تواند عاملی برای صلح و تحقق حقوق بشر باشد. هرچند این عوامل محرک‌های مفیدی هستند، اما صلح و امنیت واقعی انسان‌ها از ابتکارات مبتنی بر جامعه ایجاد می‌شود. این ابتکارت، انحرافات مثبتِ شرایط یک زندگی مبتنی بر صلح و قانون‌مداری در کنار دولت‌ها و دیگر قوا را ایجاد می‌کنند. بنابراین، این نوشتار روشی را مورد فرض قرار می‌دهد که شهروندان در تشکلات مذهبی و دولت‌های (محلی و ملی) و عوامل تغییر بین‌المللی، برای تبدیل مخاصمات به صلح و اصلاحات امیدوار کننده، درگیر هستند. این مقاله اصول کلی صلح‌سازی‌ای که در بخش‌های توسعه انسانی، امنیت و فعالیت‌های حقوق گرا اعمال می‌شوند را مشخص می‌کند. این بخش‌ها ممکن است شامل موارد زیر باشند: سلامت، حفاظت، آموزش، امنیت، کار، معنویت و مسئولیت اجتماعی مشارکتی. 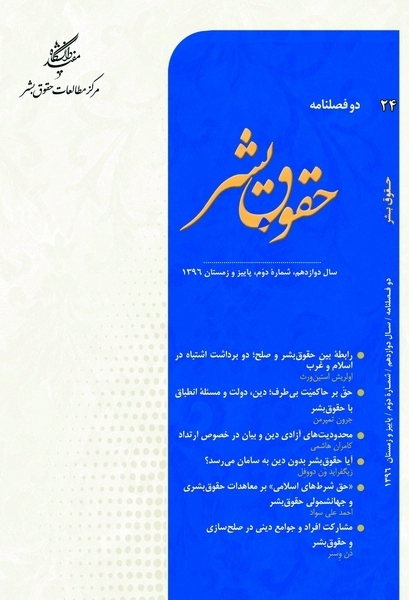 در اینجا همچنین تلاش می شود چالش‌های پیشِ روی حقوق بشر و صلح‌سازی در کشورهایی که دچار بی ثباتی هستند و یا در پروسة بازسازی پس از جنگ هستند را بررسی کند. دسته بندی‌ها ممکن است شامل موارد زیر باشند: مراحل و انواع درگیری‌ها، دولت‌های شکننده و شکست خورده، جمعیت‌های نادیده گرفته شده، تبعیض قومی و نژادی، سیاست و دادگستری فراملیتی، توزیع منابع طبیعی و ثروت و سرمایه اجتماعی. Professor of International and Political Studies, Future Generations University of America. This people factor is too little understood, even though the role of citizens in transitional states has long been acknowledged as essential for just and sustainable change. For peace accords and international conventions, in and of themselves, do not make peace or deliver human rights. Neither does the arrival of international peacekeepers nor the speeches of clerics and political leaders. While these developments are helpful stimuli, real human peace and security derives from community-based initiatives that create a “positive deviance” for peaceable, rights-oriented living vis-à-vis governments and other forces. Thus this paper will hypothesize a methodology whereby citizens engage religious institutions, governments (local and national), and international change agents to transform conflict into promising peace and rights. It will identify common peacebuilding principles operating across sectors of human development, security, and rights-oriented work. These sectors may include at least the following: health, conservation, education, security, labor, spirituality, and corporate social responsibility. This paper also seeks to hone a typology of human rights and peacebuilding challenges facing countries of instability and post-conflict rebuilding. Categories may include at least the following: stages and types of conflict, fragile and failed states, overlooked populations, ethnic and racial discrimination, transnational politics and justice, natural resource and wealth distribution, and social capital. Herald Tribune, 10 March, pp.1, 13. 3. CBS News (1987). “Vietnam 101.” 60 Minutes (New York: CBS News, October 4). 4. CBS News (1988). “e Wall Within.” 60 Minutes (New York: CBS News, June 2). Resources for a New Century, Washington: The Project for the New American Century. 6. Falk, Richard (2002). “A Dangerous Game”, The Nation, October 7, pp.5. Iraq Crisis and International Law, Santa Barbara: Nuclear Age Peace Foundation, pp.21-22. is Called For”, Christianity & Crisis, October 18, pp.216-217. Endless Deployment”, The Nation, October 21, pp.13. 11. Jamieson, Neil L (1993). Understanding Vietnam, Berkeley: University of California Press. Interpretation, New York: Charles Scribner’s Sons. Politics, New York: Charles Scribner’s Sons. Number of Suicides among Vietnam Veterans”, American Journal of Psychiatry Vol. 19. Editorial Board, (2003). “Bush’s Messiah Complex”, The Progressive, Vol. 67, No.2, pp.8-10. 20. Spencer, David (1986). Facing the Wall, New York: MacMillan. 21. Bush, George W (2002). “President Bush on Iraq,” Online NewsHour. 23. Said, Edward (2002). “oughts about America”, Al-Ahram Weekly Online.